In October 2018, Southwest Research broke ground on a Supercritical Transformational Electric Power (STEP) pilot plant to demonstrate supercritical carbon dioxide (sCO2) technology. The novel 15-acre facility, located on the grounds of SwRI in San Antonio, will house first-of-its-kind equipment to demonstrate and test sCO2 as the working fluid in power system components. The U.S. Department of Energy contributed nearly $80 million to the project. The system will be part of an effort to advance a power generation technology with the potential to produce lower cost electricity with reduced emissions. The 10-MWe STEP power plant will use sCO2 as a power source. The STEP facility is designed to address some specific technical challenges to commercialization of the promising sCO2 technology. The benefits of developing and deploying this are crucial to efficiently using conventional power supplies as we move forward implementing alternatives. 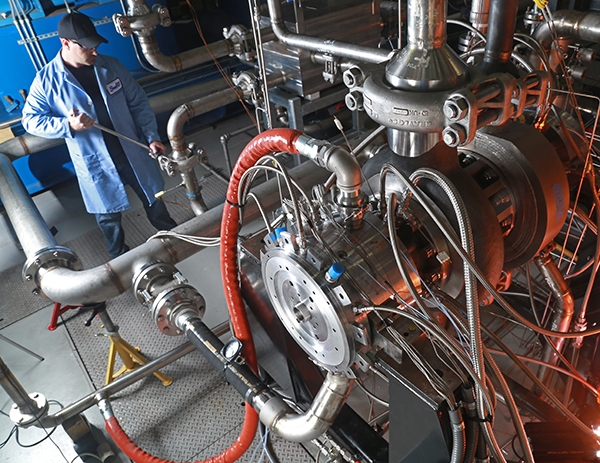 STEP objectives include refining the sCO2 power cycle, demonstrating component performance and scalability, and designing the facility to accommodate multiple new supporting technologies. SwRI and GTI broke ground on the new facility in October. Construction will be completed in 2020. When the facility is completed, SwRI researchers will strive to advance the technology for commercial adoption. They’ll also work to refine the sCO2 power cycle, demonstrate the machinery’s scalability and performance ability. The plant can be configured to provide on-site user training as well as operations experience, which will contribute to the effort to commercialize this technology. It has also been designed to adapt to industry changes as well as to provide educational and research advantages. Even after sCO2 power cycles expand to the commercial sector, the facility is positioned to serve as a testbed for expanding the improving the technology. Or call Aaron McClung at +1 210 522 2677.